It is good to meditate on the Scriptures, but we should seek to be led by the Spirit of God, so that we eat fresh bread, and have the right word for the situation - so we don't by-pass a relationship with God. The Holy Spirit will often remind us of a Scripture. Then it is the Word of God for us at that time. It is His voice we should be listening out for, as we read or study it. It points to Jesus, like the prophet who prepared the way. Some legalistically follow preferred verses of Scripture, like the Pharisees, but do they know the Holy Spirit leading? Do they know the power of God who is in them? When Jesus comes again will He say to them, "Why do you want to be with me now? Do you know who I am? I don't know you." Do you know Jesus? Jesus declared He is Lord when he said, "I tell you the truth, before Abraham was born, I am!" He is YHWH - The 'I Am' of the Old Testament and the New Testament. He is the Lord who is coming again. In Exodus 3:15 God tells Moses יהוה (YHWH) is the Lord. "This is my name forever. Remember this from generation to generation." Walk in the power of the Holy Spirit. The fruit of the Spirit, ἐγκράτεια means in strength, in dominion, in power. It's made of two words, ἐν - in, on, among and κράτος - strength, power, dominion. We have translated it SELF-control (Galatians 5:22-23). How awful! It should be "in the strength" of the Holy Spirit, in His power. Surely this means walking in power! If you walk in the Spirit you won't gratify selfish desires. Your focus will be eleswhere. Meekness is similar. For the Christian this means our strength is in our master, Jesus's hand, to use as He wants to. We are not the ones controlling Christ. He is the one we welcome in us. He doesn't empower us to be wimpy or invisible, having no impact on the world. We are empowered with the dynamite power of the Holy Spirit. We are placed as lights in the world. God is meant to be seen shining through us. 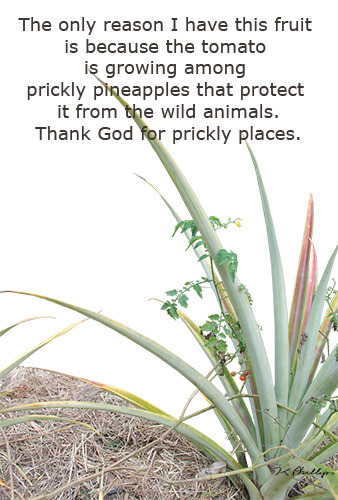 The fruit of the Spirit are not just for us to eat and enjoy. They are a feast for us to share, so the body of Christ can grow up into Him and so the world will know God is here, in and among us. The fruit of His presence is present in the present. Ever wonder why so much is hidden from us, why God hides Himself from us? Perhaps it's because we cannot cope with seeing Him as He is. He is so gifted, so Holy, so powerful, so beautiful, so deep ... His love for us is an ache that would consume us, bowl us over if we saw or felt the fullness of it. His passion for us would burn us like fire if we saw the fullness of it. Jesus stands in the gap as a human so we can experience God in a way we can cope with and yet sometimes our small mindedness makes us want to run from Him, or make Him as small as we are. When we accept Christ as King, we are in the world and in the Kingdom of God, which is growing and not of this world. Let's build for the next generation, not just our own. Jesus said, "My kingdom is not of this world/universe. If My kingdom were of this world, then My servants would be fighting so that I wouldn't be handed over to the Jews; but as it is, My kingdom is not from here" (John 18:36). None of us are above falling foul of the crafty spirit of the anti-christ, so don't be afraid or critical of others if you think they have. Don't tear them down. The tares grow up with the wheat. Pray for them. Pride - satan magnifies himself above all things. Magnify Jesus. If we think we are above falling foul of pride -we have already done so. Satan wants us to think our ministry is a special one - more special than others in the body. Satan also wants us to think we are above being corrected by each other. The scripture says "Submit yourselves one to another." This means listening to one another. This doesn't mean blindly trusting what others say. No-one is above needing to listen to others, but listen to what the Holy Spirit is trying to say through them and test what is said by the scriptures and the character of God. We are human vessels trying to share spiritual things and language is limited. We don't get it right all the time - only Jesus does. That's why we need each other. That's why we are a body. We love and care for our body. We correct in humility knowing we are subject to the same frailty. It's particularly important for those of us, who think we have a message from God, that we allow it to be tested by others in the body so that what is true and what is not can be discerned and don't forget to submit it to Jesus too and be prepared to let it go if it's not from Him. Even God is open to reason. Look at the times people have reasoned with Him and what the outcome has been. He wants honest communication. He listens to us and wants us to listen to Him too. Gaze at Jesus. He is the good/beautiful shepherd. Learn to eat from His basket. If you keep looking at others you may think your ministry should look like theirs. You may think numbers are more important than individual growth. You are unique and even if you have similar gifts, your ministry of them may look very different. If you gaze too much at others you may fall foul of discouragement or jealousy. You may become ridgid, legalistic or critical of others. If you gaze too much into the future you may become afraid, inactive, or miss your footing in the here and now. If we gaze at ourselves too much, we may fall foul of pride or a critical spirit. When our gaze is not where it should be we leave ourselves open to things like adultery and following others instead of the Holy Spirit. False or True? What to do. If you see or hear any prophet or leader you think is heading down the wrong path, pray for them; intercede for them. It is easy for anyone to fall foul of the same evil they start out binding or discerning. If you discover you are/were that prophet, then it's not too late to turn around. Sometimes you end up in the muddy waters but this can give you insight and wisdom on how to help others who are drowning in the same ones. Be aware that there are many end time views. Eat fresh bread each day, not last weeks bread and follow the leading of the Holy Spirit. Paul faced many trials and told us not to be surprised if we do too, so don't let anything you face rob you of your bold confidence in God's unfailing love. Remember we need each other's gifts to grow up into Christ. The apostle Paul said we see in part and should listen to one another. The early church checked out the Old Testament to understand what was happening. We can still do that today, plus we have some of what they discovered in the New Testament. Don't forsake the reading of it. 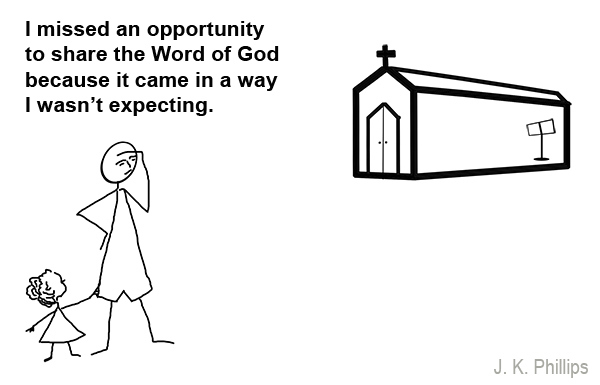 Timothy was encouraged to keep reading it. If you believe God has revealed some disaster that's about to happen, you can intercede for those who will be affected and pray that God will have mercy and stop it. Better to do that than try to make a name for yourself as a prophet by wanting the disaster to happen so everyone knows you're a prophet. Some aspects of love only grow in suffering - e.g. how do you think you get to exhibit long suffering or patience? We can sing and pray together, eat a meal together and worship together, but is there love among us? Is love visible to all? What would it look like if it was; God in our midst? The Scriptures tell us God is love. Whose glasses are we wearing when we critisize other's in our church or other churches? The manger is now empty but the light still shines. It shines through multi-coloured clothing of people decorated in the Christmas blessing, easy to miss if you are expecting to see it the way you want to see it. This was a first century problem and still is a problem today ... and Jesus has forewarned us. On the day when all see Him as Lord everyone will say, "when did we see You?" (Matthew 25) There are times when we all fail to see His light; to see Him as He really is. It is time to wave the palms; to welcome and acknowledge Jesus' place. He is Lord. His life was and is a gift of great worth. Accept His life and celebrate with Him this Christmas. His life is still a gift born in the manger of human lives willing to accept Him. His life is still light to the world and light to our path. 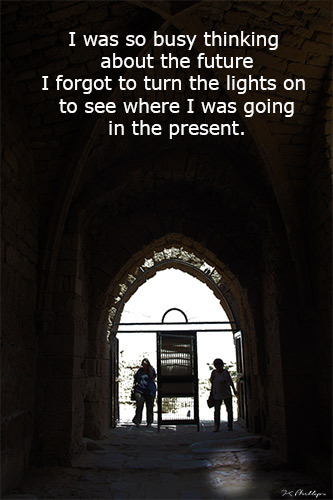 If you have this light, share what you have been given. Gifts are one way we celebrate Christmas. Is there room in your life for the best gifts? 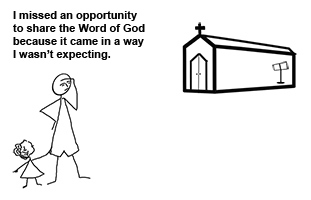 Is there room in your church to open them? Is there love in your heart to let the light shine even in the dark places of the world? How many times has the Lord said "Sing a new song" and you complain. You want to sing the songs you know and like. You older ones, did you sing nursery rhymes to your children? Why then do you dig your feet in and complain about singing songs that others in your congregation like? Do you want all the younger ones to have to wait until all the older ones die out before they can enjoy a "new song" like those who waited for the promised land? Love considered others. You younger ones, the scripture doesn't say "sing new songs" but "sing a new song." One new song each service is more than enough, maybe too much for people to learn it and enjoy it. Let there be songs for all to sing and let us be aware that everyone likes to sing songs they know. We are in this together...or we should be. Should we cater to our own selfishness? Psalm 96:1-13 "Oh sing to the Lord a new song"
Psalm 98:1 "Oh sing to the Lord a new song." Psalm 40:3 "He put a new song in my mouth"
Isaiah 42:10 "Sing to the Lord a new song"
Psalm 144:9 "I will sing a new song to you, O God"
Be open and upfront about the problems in your church. Don't back away from them or hide them. Talk about them before everyone so that an undercurrent of criticism is not encouraged. What do you go to church to hear; the minister or lay preacher? a visiting speaker? a famous preacher? God wants you to go to church to hear His voice. Take your eyes off the preacher or the prophet. They are only there to prepare the way for the Lord, for Jesus. Ask the Lord to open your ears to hear what He is saying in the sermon, then you won�t be always criticizing the messenger, then you won�t be bored with hearing the same bible readings you have heard before. God turned the crucifixion of His son Jesus into a blessing for you. Now you can share His resurrection life. You can know His Holy Spirit in you. You can know His word. The lord turns waste lands into gardens. He turns the evil that is purposed for His people into a means of blessing ... so seek the Lord. "My message and my preaching were not with wise and persuasive words, but with a demonstration of the Spirit's power (1 Corinthians 2:4)." Is Jesus standing at the door of your church knocking because you have made your way of worshiping a tradition, or something else your leader? Let Him in and give Him the place of honour. Let Jesus lead His Church for He is the head. If Jesus came in singing and dancing would you tell him to be quiet? If Jesus came in hungry or homeless would you give him the resources He needed? If Jesus wanted to interrupt your sermon or your liturgy, would you listen to Him or is there no room in your inn? When Jesus spoke of the "gathering" He didn't talk of outward things, not even a building. He wanted his disciples to take their eyes of the beauty of the physical temple and look at Him. He wanted people to worship honestly, not just do and say what others say; from your heart. This doesn't mean never using prepared written words. David wrote words down to be read and sung formally like litergy. It is what's going on in your heart when you read prayers or psalms or sing songs. Truth, worship truthfully in the Truth. Jesus told his disciples He was in the midst of those who gathered in His name. This is what is important. 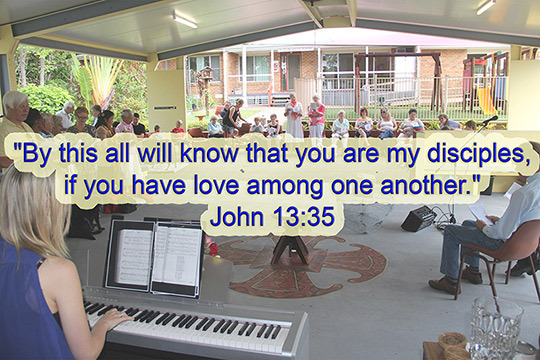 The church or gathering is a living building of people with their eyes on Jesus.